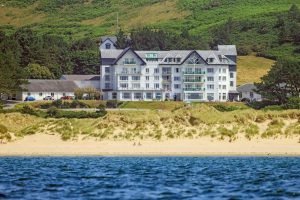 Trefeddian Hotel named best in Wales by the AA | News by Wales Express News, People Before Profit! 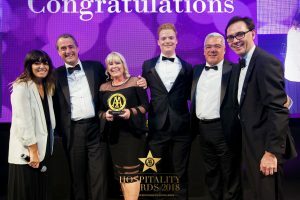 A popular coastal hotel overlooking Cardigan Bay in the picturesque Mid Wales seaside fishing village of Aberdyfi has been named AA Hotel of the Year for Wales. The Trefeddian Hotel collected the prestigious accolade at the annual AA awards in London last night (Monday). Open to hotels of all sizes and styles, the award is the AA’s ultimate accolade in Wales. Having been run by four generations of the Cave family since 1907, The Trefeddian Hotel has 59 bedrooms and 54 full time staff. The Trefeddian Hotel’s managing director, Caroline Cave-Browne-Cave, her son Tom Cave and general manager William Moeran received the award from a representative of award sponsor Chargemaster watched by host Claudia Winkelman and the AA’s hotel and hospitality services managing director Simon Numphud. Ongoing investment in the hotel’s facilities and infrastructure has included the complete refurbishment of the indoor swimming pool, spa bath, lounges and dining room and the construction of two luxury self-catering units in the grounds, which are due to open next year. Blessed with a stunning location, The Trefeddian Hotel enjoys panoramic views over Cardigan Bay and four miles of golden, sandy beach. Located in the Snowdonia National Park and Dyfi Biosphere, the hotel is ideally placed for golfing and activity breaks as it overlooks a links golf course and is within a short drive of Coed-y-Brenin Mountain Bike Centre. An AA Inspector said of Trefeddian Hotel: “This family-run hotel is in a delightful location, with bedrooms that enjoy views over the championship links golf course and sea. Traditional, welcoming hospitality and attentive service is assured and many guests regularly return. No stranger to awards, The Trefeddian won the Best Loved Hotels Award for Wales last year and, in 2016, collected the Extra Mile accolade for customer service in the same awards together with two Editor’s Choice awards from The Good Hotel Guide 2017 for golf hotel and family friendly hotel. The hotel is a long-standing member of MWT Cymru, an independent organisation representing around 600 tourism and hospitality businesses across Powys, Ceredigion and Meirionnydd.